Judy Ko is BGA’s senior advisor for Myanmar. She has worked in diplomacy, the non-profit sector and consultancy in both Myanmar and the United States. She served for nearly two decades at the U.S. Embassy in Yangon and is well versed on Myanmar’s key players and political and economic issues. Judy began her career as an educator, but moved on to the public sector when she served as a foreign correspondent for Myanmar’s Ministry of Hotel and Tourism. She left the ministry for the Swedish Consul-General and served a leading role in a U.S. Agency for International Development project liaising with Myanmar’s Ministry of Cooperatives. 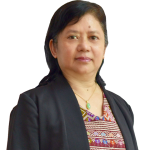 In 1988, Judy joined the U.S. Embassy in Yangon and served for two decades in a variety of capacities, beginning as an economic specialist, analyzing and reporting on trends and developments in Myanmar. She then transitioned to become a political specialist, where she fostered ties with key players in Myanmar and analyzed the country’s political, economic and social developments. While working at the U.S. Embassy, Judy received multiple prestigious awards, including the U.S. Department of State Foreign Service National of the Year Award and the Appreciation Award for Loyal and Courageous Service. Judy left Myanmar for the United States in 2005, where she worked at the National Endowment for Democracy as a Reagan-Fascall Democracy Fellow and a fellow associate for the International Forum for Democratic Studies. She developed a variety of grant programs for Virginia-based Global Community Service Foundation (GCSF) before returning to Yangon in 2010 to implement the successful GCSF project. Judy received her master’s degree in mathematics and Bachelor of Science from the Rangoon Arts and Science University in Myanmar.